I was hesitant to read such a book. What happened during the Nazi Regime in Germany before and during World War II, always made me feel uneasy. This unease always thickened when talking about the infamous Dr. Josef Mengele, the head physician of Auschwitz, who performed gruesome surgeries and medical procedures in order to prove the inferiority of others. Auschwitz puts you front and centre with Mengele and his unbelievable inhuman deeds. It follows Jewish doctor Miklos Nylszli who documents his time as a prisoner of the Nazis Regime at Auschwitz and the horrific deeds he was forced to do under Mengele. The book is a harrowing journey from start to finish, an indecent and nauseating look at the cruelty that humanity can do to itself. Nylszli never makes excuses for himself as to why he went along with what was told of him. He shows visible disgust of what is asked of him, but he does it in the hope that one day he will be reunited with his wife and daughter, both of whom have been placed in a concentration camp. He details every little image and sense, from the look of the camps and its inhabitants to smell of burnt flesh that lingered in the air when bodies were burned after the extermination in Crematorium II. He talks about his battle to keep his sanity which kept slipping slipping further and further away from him the more he witnessed and the hopelessness he felt as he watched countless others marched to their deaths. In the pages of his book Nylszli describes an incident which stayed with him, something so horrifying, something that was a complete betrayal of his vocation that he vowed fto never pick up another scalpel for the rest of his life. With anger and sorrow he relies the incident that turned his profession, a tool to save lives, into a tool of death. This incident centred around a father and son, who were experimented on and killed to have their skeleton prepared for transportation to an Anthropological Museum. They were to be used as proof in the Nazi’s mad idea of human inferiority. Mengele asked Nylszli to suggest the fasted way to remove the bones from their muscle, and Nylszli suggested boiling. The bodies of these two human beings were set in vats to boil in he sun and soon the smell of cooking flesh bought the noses of starving concentration camp prisoners. 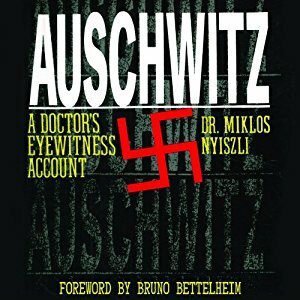 Auschwitz: A Doctor’s Eyewitness is available through Amazon, Audible and your online retailer.